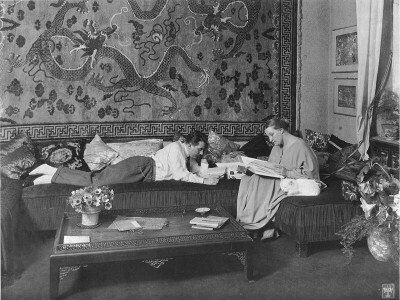 This photo shows Fritz Lang and his wife Thea von Harbou in their Berlin apartment, 1923 or 1924. The two worked together a great deal during the 20s and wrote the script for Metropolis together. However they separated in 1931 and divorced in 1933 as Hitler came to power. 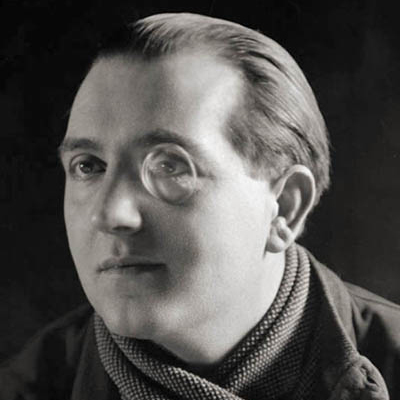 Thea joined the Nazi party and continued writing scripts during the war — however Lang’s mother was Jewish and thus he was lucky enough to flee Germany. 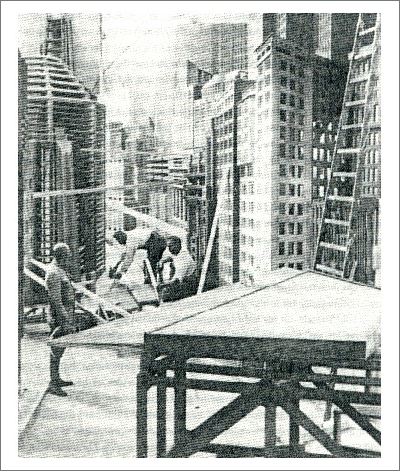 This amazing photo shows Lang on the set of the flooded city of Metropolis. 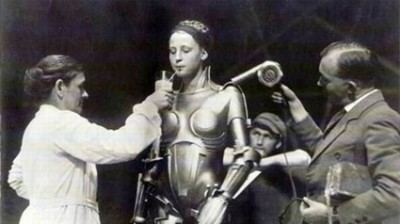 Actress Brigitte Helm played Maria and the robot in Metropolis — like Lang she left Germany in 1935 and moved to Switzerland where she lived until the age of 88 in 1996. She retired from filmmaking but left behind an amazing legacy from the silent film era. 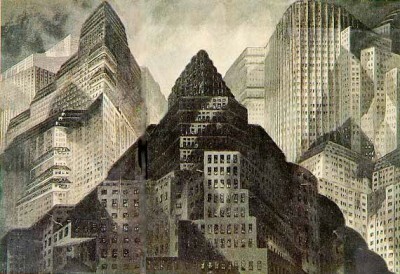 This is an Architectural drawing of Metropolis by the artist Erich Kettelhut (1893-1979). Kettelhut got his start as a stage-set painter and worked on quite a few of the expressionist silent films of the 20s including earlier collaborations with Lang on Dr. Mabuse der Spieler (1921) and Die Nibelungen (1924). 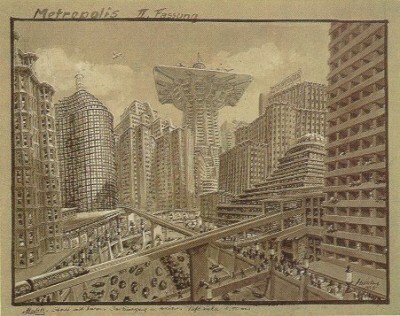 This drawing by Kettelhut was actually used as part of the opening sequence of Metropolis. It was created with a combination of dawring, oil pant and gouache on cardboard. 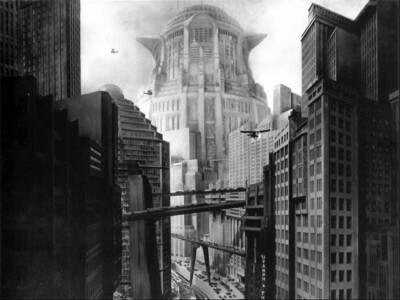 This was a preproduction sketch by Kettelhut which showed the city of Metropolis — this was the second sketch he did and you can see how he slowly evolved from a cityscape that looked like a Manhattan skyline to something had more of a science fiction flavor. 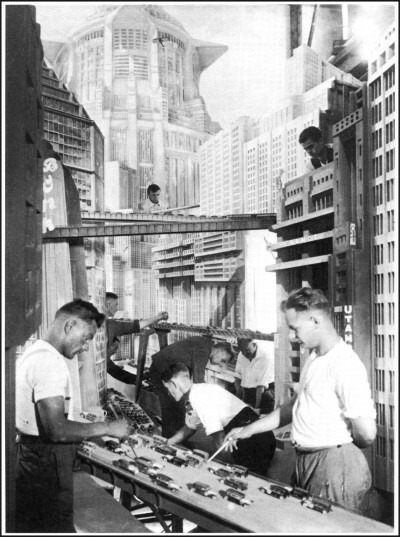 And here are carpenters at work making those preproduction drawings come to life. If you look at the center of the drawing you can see the left side of the central building of Metropolis which would inspire the film Blade Runner over fifty years later. Frau Im Mond (Woman in the Moon) from 1929 was years ahead of its time in showing a journey to the moon. 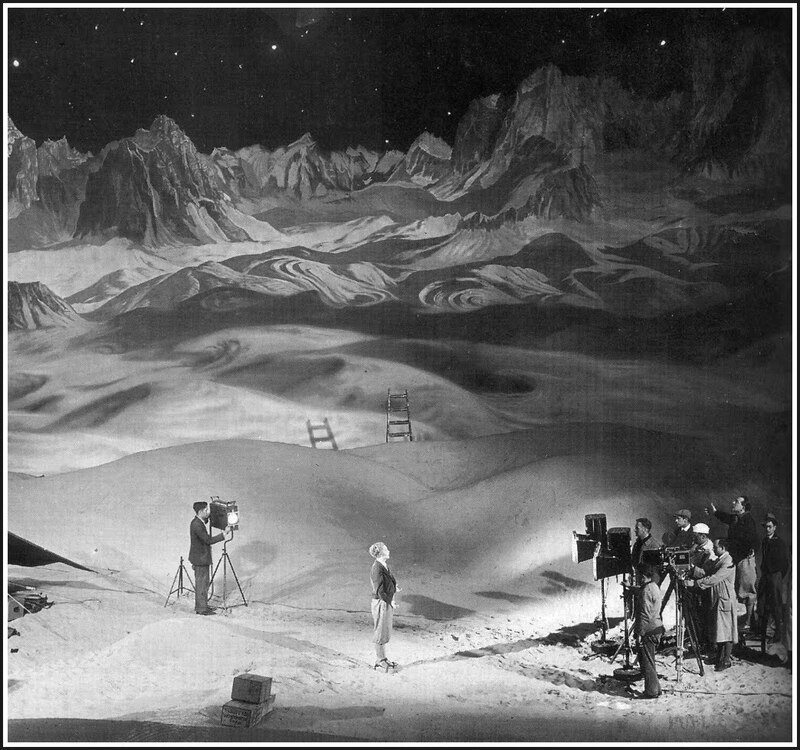 This photo shows them filming on the set of the moon which features a giant backdrop painting of a lunar landscape. 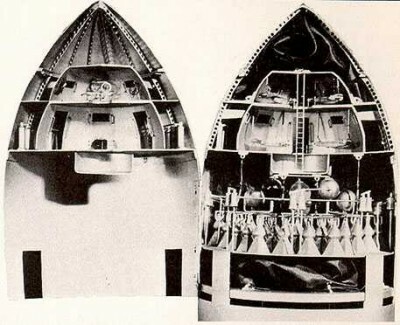 This is the model of the rocket used in Frau Im Mond which shows the amazing amount of detail that Lang would put into his films. In fact the rocket scientist Hermann Oberth was a technical advisor to Lang on the film which became very popular with Wernher von Braun’s circle. After World War II Oberth went to work for Wernher von Braun doing work for NASA and while he retired in 1962 he did witness the first moon launch of the Apollo 11. 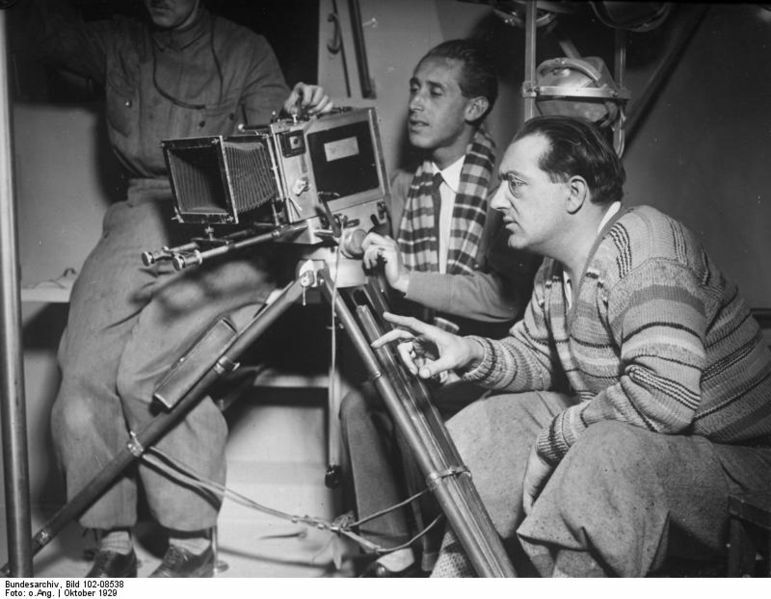 This photo shows the master at work — on the far left is Fritz Lang instructing the cameraman on the set of Frau Im Mond. 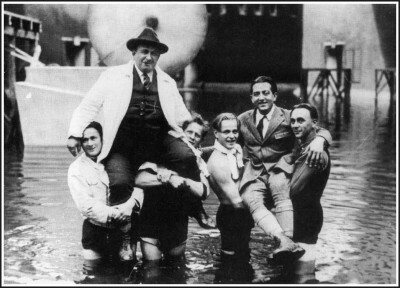 When Lang moved to America he did a great deal of work in Hollywood including many films that were westerns and film noir, but sadly he never returned to making science fiction films. 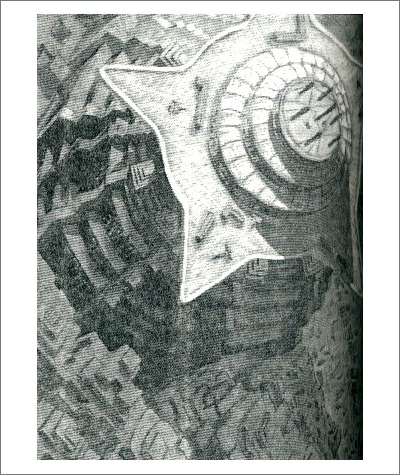 My special thanks to ectomo.com, projectrho.com, leninimports.com, and goldenagecomicbookstories.blogspot.com.